The Apple Battery Charger sets a new industry standard: It has the lowest standby power usage value — or "vampire draw" — of any similar charger on the market. That’s the energy most chargers continue to draw after their batteries are fully charged. But the Apple Battery Charger senses when its batteries have finished charging and automatically reduces the amount of power it needs. In addition, the reusable batteries that come with each Apple Battery Charger are designed to maintain a high charge capacity for hundreds of charges, so you no longer have to buy new batteries or throw them away every few months. After your battery charge cycle is complete, the Apple Battery Charger reduces its power intake to 30 milliwatts — that’s more than 10 times better than the industry average. The smarter way to charge. When the Apple Battery Charger recharges your batteries, it not only maximises battery performance and lifespan, it also conserves energy. Thanks to an intelligent power management system, the Apple Battery Charger uses less power once your batteries are fully charged, making it one of the most energy-efficient rechargeable battery solutions ever. 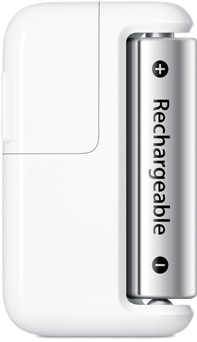 The Apple Battery charger can recharge one or two batteries at a time. It's optimised for Apple-supplied batteries and it works with AA NiMH batteries from other companies, too. Fully loaded. And then some. Each Apple Battery Charger comes with six high-performance AA NiMH batteries — two for your keyboard, two for your mouse or trackpad and two for charging. Unlike many other reusable batteries, these batteries have an incredibly long service life — up to 10 years.Which means you can finally break the cycle of buying and disposing of those toxic, single-use alkaline batteries. The batteries that come with the Apple Battery Charger kit also have an extraordinarily low self-discharge rate. Even after a year of sitting in a drawer, they still retain 80 per cent of their original charge.That way, you always have backup power when you need it. The Apple Battery Charger is as well designed on the outside as it is on the inside. It has a sleek, compact shape so you can plug it in between tangles of desk wires or pack it neatly in your computer bag when you travel. And like Apple power adapters, the Apple Battery Charger is designed with a removable AC plug, so you can replace it with plugs that fit different power points around the world.